The ratio of net power available at the shaft (Pout) and the net electrical power input (Pin) to the motor is called as overall efficiency of an induction motor. 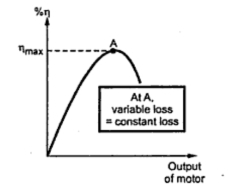 The maximum efficiency occurs when variable losses becomes equal to constant losses. When motor is on no load, current drawn by the motor is small. Hence efficiency is low. As load increases, current increases so copper losses also increases. When such variable losses achieve the same value as that of constant losses, efficiency attains its maximum value. If load is increased further, variable losses becomes greater than constant losses hence deviating from condition for maximum, efficiency starts decreasing. Hence the nature of the curve of efficiency against output power of the motor is shown in the Fig. 1.